There are two types of anglers in the world… those that run from the rain and those that tough it out. 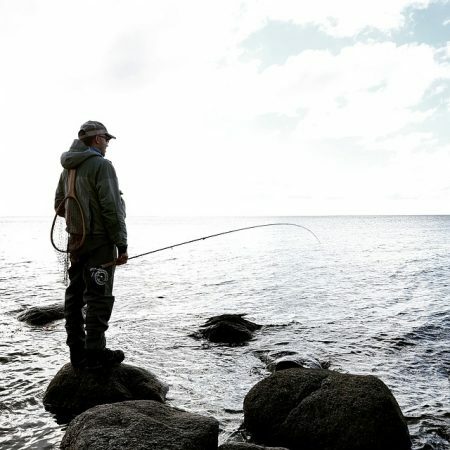 For many anglers, avoiding the rain is not just about staying dry. Some people feel like it is not worth the effort because fish do not bite in the rain. This is simply not true. You just have to adjust your strategy. In this article I will cover some changes you can make to ensure your time in the rain is productive. Hopefully the next time the clouds roll in you are more inclined to enjoy some additional fishing time. As it starts to rain, water from feeder streams may start to dump into the lake you are fishing. This additional activity can kick up mud and debris making the water murky. The limited visibility can really hurt your activity if you just keep fishing as you were before the rain. There are three primary things you can do to keep the fish biting. Fishing the downside of the lake will hopefully keep you in clear water for at least a while. You may even want to move into the streams or rivers down the lake. This water should be your best opportunity. You may need to move around more in order to find where the fish are biting. Do not fall in love with any given spot. 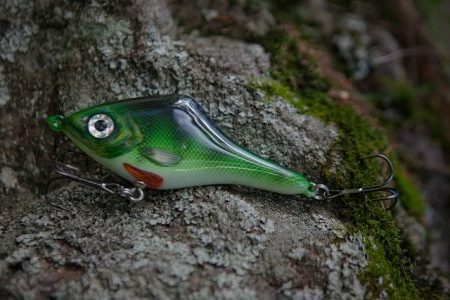 Your best bet is to drop the finesse lures and switch to lures that cause a great deal of noise and movement. You are now competing with the sound and movement of rain hitting the surface of the water. You may also want to add some scent to your lure. If you are fishing a lake and the water level starts to rise, the location of the fish will change as well. All of the areas along the shore with vegetation in only inches of water will soon be prime real estate. As the water rises, these area will be ideal hiding spots for the fish. You will also need to change your lure depth based on how much the water rises. Whenever the light is limited and the surface of the water is disturbed, dark colors are your best bet. Fish have a hard time seeing lures in low light, so you really need a good silhouette that will stand out. Blacks, dark greens, and dark blues are going to create the visibility you need. The longer it rains, the colder the water will get in most cases. Fish prefer to stay in water that is above 60F, so they will tend to move to these waters. Protected areas such as coves and around structures like bridges and dams will normally hold warm water longer than areas that are out in the open. If the action starts to slow down where you are fishing, you may want to relocate to these protected areas. The wind will also be more settled around these structures. 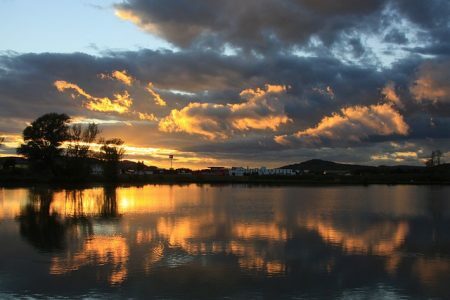 No matter how tough you are, you cannot concentrate on fishing if you are miserable. Even in the heat of the summer, rain will start to get to you after a while. It is also important that you wear gear that will not be affected by the wind. I suggest a baggy, lightweight rain suit that will allow you to dress appropriately for any temperatures maybe a hat and some gloves. It needs to allow plenty of mobility with your arms. I would suggest avoiding ponchos as they catch the wind and can make it hard to cast. They also allow your legs to get wet over time if the rain is blowing at all. Ideally, you want the suit to be small enough to throw in a backpack or even a large tackle box. Keep in mind that rainy weather can turn into dangerous weather quickly. If you see lighting get off the water quickly. Even if it is way off in the distance, it is best not to take any chances. I would suggest investing in a waterproof weather radio in case flash floods or tornados are a potential in the area. Flash floods in particular are very common in some of our favorite fishing spots and can put you in danger at a moment’s notice. 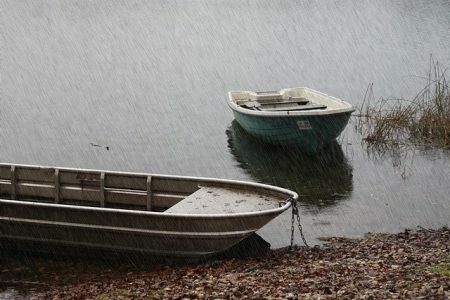 One of the greatest benefits of fishing in the rain is that you will likely have the stretch of water to yourself. Part of the reason I love fishing is just getting to be by myself and enjoy nature. 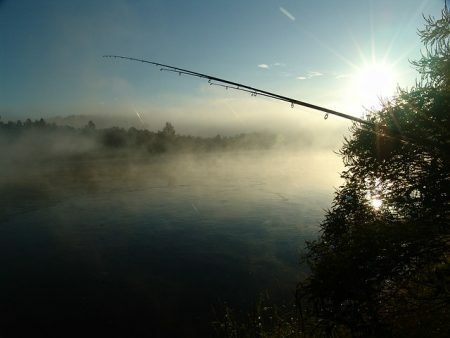 The vast majority of anglers in your area will head for the hills at the first sign of rain. Take advantage of this opportunity, and with a few adjustments you can have a great day of fishing.